THANKS TO OUR GREAT MATES AT DULUX, YOU COULD WIN 50L OF PAINT AND A CONSULT with a dulux colour designer. Entering is really easy. All you need to do is send us a photo of just how bad your current paint situation is and tell us in 25 words or less, why you need Dulux to come to the rescue! 1) Send us a photo of your project that needs some Dulux TLC to hello@therenoschool.com with the subject line: Dulux Comp. 2) Below, tell us in 25 words or less why you desperately need 50L of paint and a consultation with a Dulux Colour Designer. Thank you for your entry. Best of luck! + Prize includes one consultation with a Dulux Colour Designer and 50L of Dulux branded paint. + Dulux paint must be redeemed and collected from a Dulux Trade Centre located within Australia. 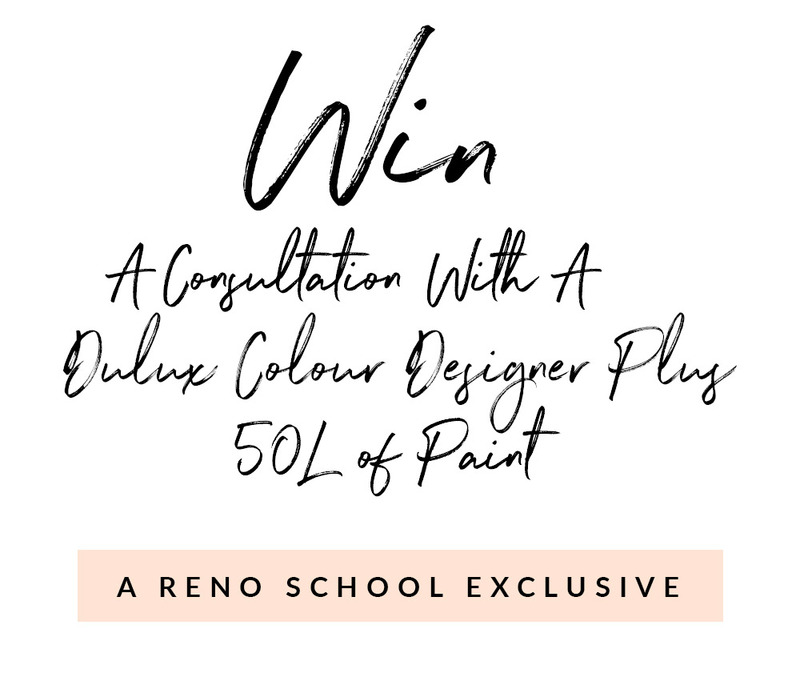 + Entry is only open to residents of Australia who are enrolled students in The Reno School. You can enter as many times as you like. + The winning entry will be picked at the discretion of The Reno School. All criteria must be met, this is a game of skill. + Competition opens 22.3.18 and ends midnight 2.4.18 AEDT. Winner announced 14.4.18 and will be contacted via email. + The Reno School, the prize providers and their associated agencies and companies will not be liable for any loss (including, without limitation, indirect, special or consequential loss or loss of profits), expense, damage, personal injury, illness or death which is suffered or sustained (whether or not arising from any person’s negligence) in connection with this competition or accepting or using any prize, except for any liability which cannot be excluded by law (in which case that liability is limited to the minimum allowable by law). Nothing in these conditions restricts, excludes or modifies or purports to restrict, exclude or modify any statutory consumer rights under any applicable law including the Competition and Consumer Act 2010 (Cth).